Anyone who possesses a valuable and unique watch will also want something special from the bracelet that is worn with it. 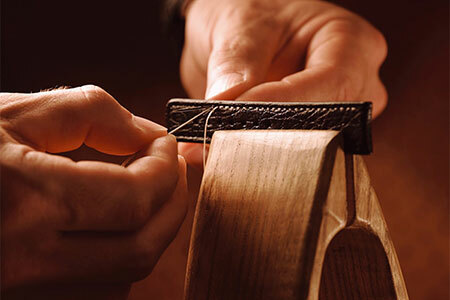 Hirsch straps are masterpieces, each created by craftsmen in a process involving over 60 separate stages, giving each individual watch strap its own elegance and beauty. In all our bracelets the passion and the experience of the House of Hirsch are clearly evident. 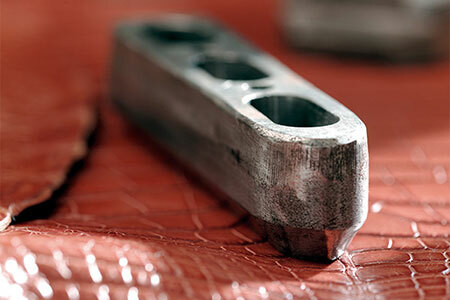 In the course of development activities which have taken place over a number of decades, Hirsch, together with the finest Swiss watchmakers, have created and implemented standards of production and quality which today are a benchmark for the entire sector. At Hirsch we are continually striving to improve quality and also to improve each individual production stage, and to develop new technologies, processes and materials, in order to satisfy the requirements of our customers and all who love fine watches. One milestone in quality optimization has been the development of the Hirsch Oysterglove Supersoft lining leather, which guarantees softness and comfort in wear. Oysterglove is a waterproof and perspiration resistant lining leather, tanned in a way that is kind to the skin and discreetly colored, and contributing to a significantly extended duration of life for the replacement watch band. 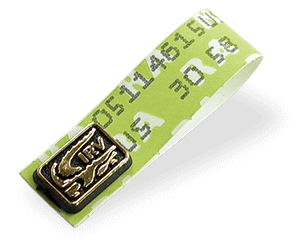 The elegance and durability of a replacement watch band depend largely on the quality of the materials used. At Hirsch we consider it essential to exercise the greatest care in the choice of materials, both for the upper leather and for the lining leather, in order to provide softness and comfort in wear. Leather is a raw material of high quality and rich tradition, and it is also a living material that requires a great deal of knowledge and experience and a certain necessary "feel" in order to be made into a fine Hirsch watch band. Working with leather presents a new challenge every day, for no two animals are alike and no single piece of leather is like any other, either in its appearance or in its consistency. The process of tanning must be undertaken in order to make the animal skin durable and to transform it into a resistant and to some extent water repellent material. The chemical combination of the protein in the skin and the tanning agent turns the hide into leather. The tanning agents used are either of vegetable origin (wood, bark, fruits) or of mineral origin (metal salts containing chromium, zirconium, aluminium, titanium or iron), or a combination of the two. Alongside the quality of the raw products, it is the type of tanning that determines the quality and characteristics of the leather end product: strength, elasticity, water tolerance and also such characteristics as resistance and flexibility are decisively influenced by the tanning process. 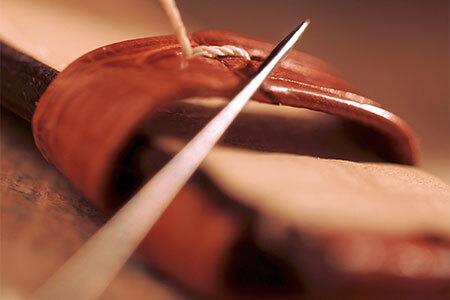 However, the finished leather always represents a genuine piece of animal skin, a true natural product with its own unique character. In a spirit of joint responsibility, the CITES (Convention on International Trade in Endangered Species of Wild Fauna and Flora) was signed on 3rd March 1973. This UN convention is also known as the "Washington Agreement", after the city in which the CITES was signed by 21 countries. Since the agreement came into force on 1st July 1975, the number of member states has risen to 183. This ordinance envisages standardized import and export regulations and also governs the marketing of listed species for all member countries. The Hirsch Artisanal collection offers a selected range of watch bracelets made of alligator, crocodile and lizard skin, all of which comply with the strictest provisions of the Washington Agreement, i.e. these leathers come from controlled stocks and are purchased and sold with a certificate. In order to create its leather bracelets, Hirsch uses top quality skins from different kinds of animals (mammals, reptiles, fish, birds). Depending on the type of animal, different leather parts can be used. With cowhide, for example, bracelets can be cut from the neck, the crop and also the flanks. 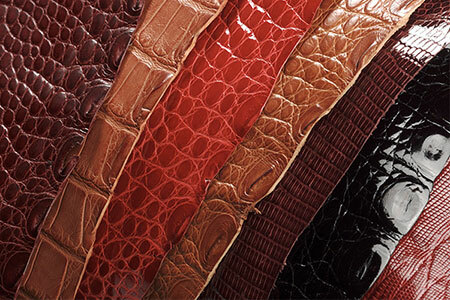 Alligator leather represents a special case. The underbelly and the tail are used, but also flanks, of small complete skins taken exclusively from farmed alligators. The main factors affecting the visual appearance and the price are the proportion of round to rectangular scales and the method used for cutting the leather. All these parts are made of pure natural materials. The utmost care is necessary in the selection of both the upper and the lining leather; only top quality materials are used. For it is only by providing the highest quality that Hirsch ensures customer satisfaction. 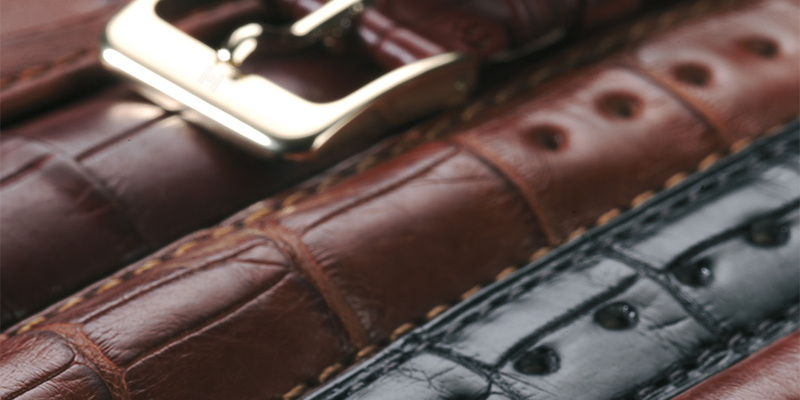 Leather watch bands are worn directly on the skin for up to 24 hours a day, 7 days a week. They are also, to a greater or lesser extend, subject to wear as a result of the actions we perform with our hands or arms. 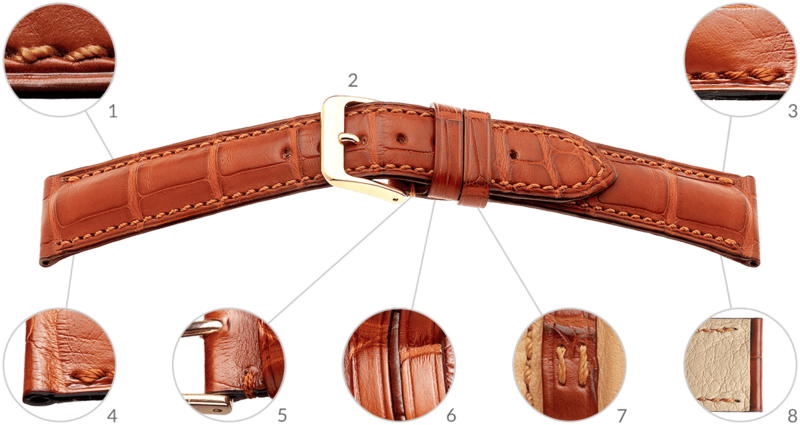 For reasons of hygiene, therefore, Hirsch leather watch bands should be cared for and subjected to hygiene checks. 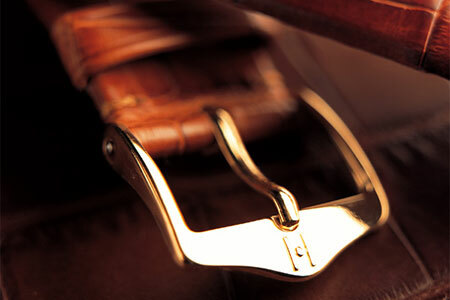 Regular care of your leather watch band will considerably extend its life. 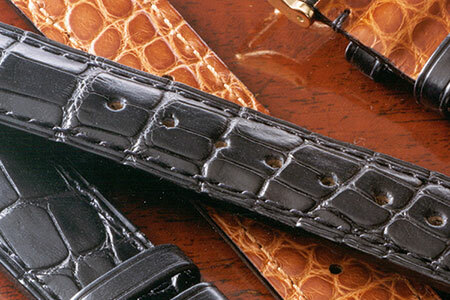 Leather watch bands from Hirsch can easily be cleaned with lukewarm water and left to dry. Hirsch leather watch bands are designed so that you can wear them with waterproof watches in the shower or while swimming in fresh or salt water. After spending any length of time in a swimming pool or in the sea, the leather watch band (like the watch, and your body) should be rinsed with clear water to remove any salt or chemical residues. A further point is that wet leather watch bands should not be left to dry on a warm surface, since rapid evaporation of water can impair quality. We therefore recommend that the leather watch band is simply allowed to dry on your hand.